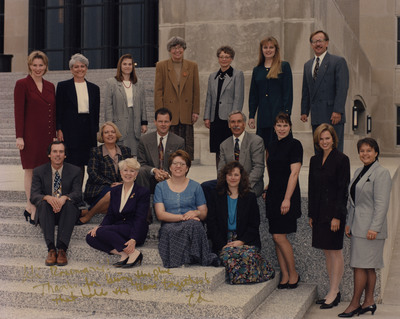 Photo of Lieutenant Governor Rosemarie Myrdal, Governor Ed Schafer, and staff members on the steps of the Capitol Building in Bismarck. Caption by Governor Schafer reads: "Hi Rosemarie! Thanks for being the glue that holds the team together! Ed."